On Sunday 29th October as we approach All Soul's Day, St Mary's Church Bocking will be offering the chance for us all to remember our departed loved ones whom we see no longer at our annual Memorial Service. It will be a reflective time, with the opportunity to light a candle and hear the names of loved ones read out. Everyone is welcome whether through a recent bereavement or one that goes back many years. We hope this will be a space and an opportunity to remember them and support each other as we journey on through life without them. 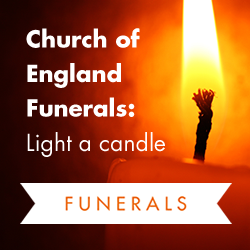 If you are unable to be with us but would like to Light a Candle, then please see the following link to the Church of England's website where you can do just that.